I first shared this recipe on Centsless Meals where I am a contributor. 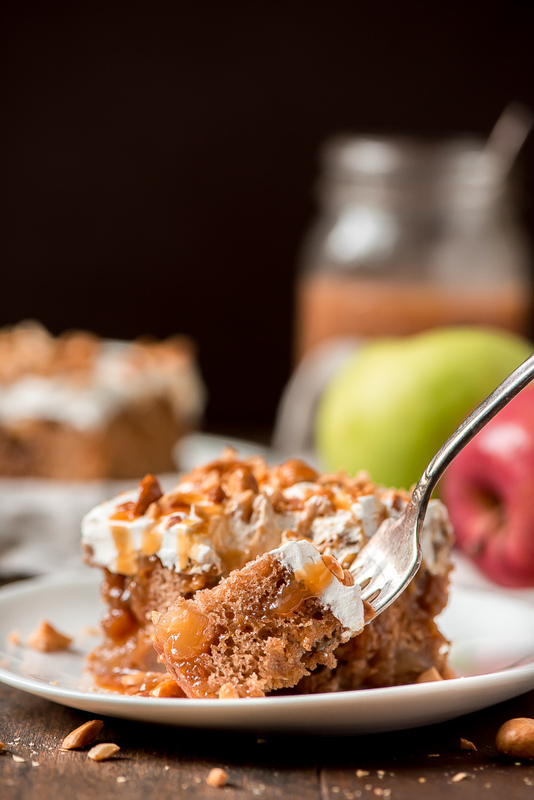 Enjoy apple season with a slice of this easy Caramel Apple Poke Cake! No one would ever guess that this sinfully delicious, moist, caramel loaded cake started from a box mix. 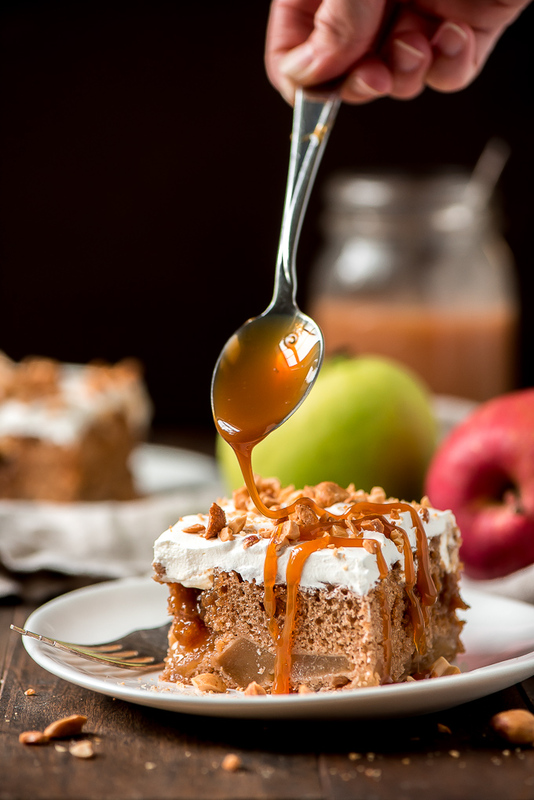 Fall is here which means it’s time to bring on all the fall flavors and eat up all the yummy treats like this Caramel Apple Poke Cake! This baby is so easy to throw together and is a definite crowd please. Bring it to your next fall gathering! 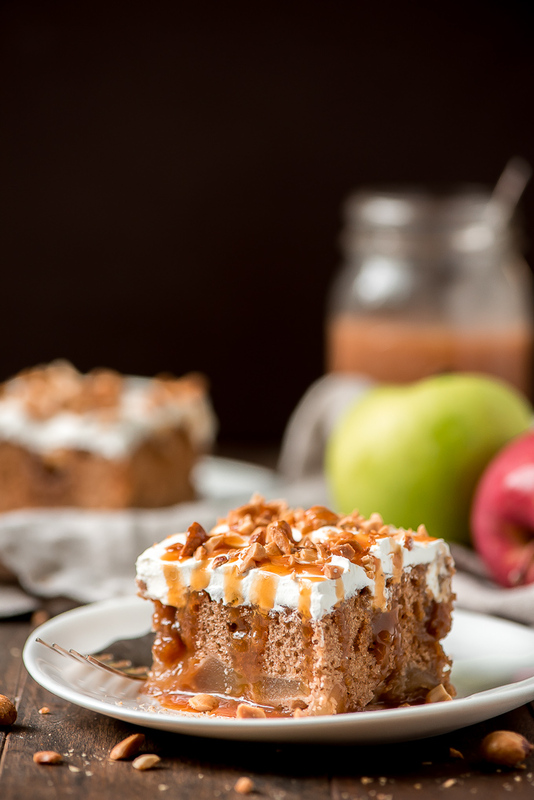 I love a classic caramel apple so why not eat it in the form of a cake?! 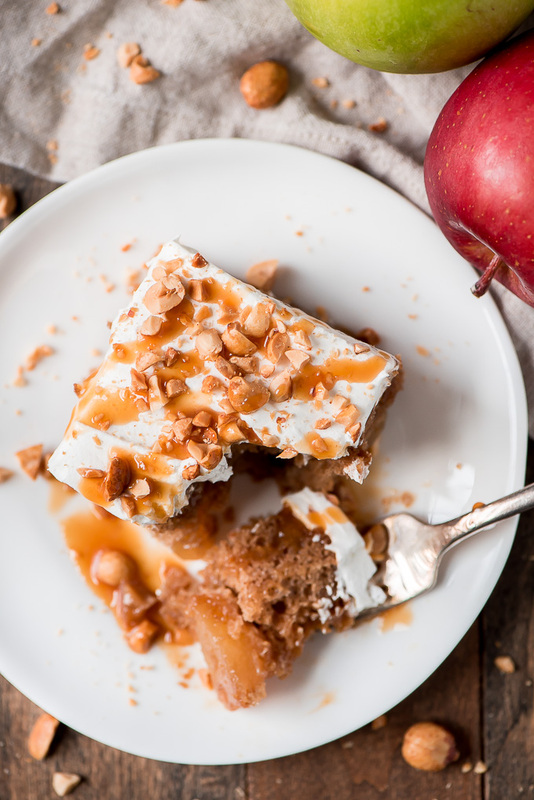 Just like your favorite caramel apple from the pumpkin patch, this Caramel Apple Poke Cake has it all– apples, Caramel Sauce, and even peanuts on top! The best part is that you don’t have to be a pro baker to make this cake. It’s a cinch to make since it’s made with a box mix and no decorating skills are required. I’m usually all for baking from scratch but the extra work isn’t needed with how much you’re doctoring things up. Typically poke cakes are made using a vanilla or chocolate mix but to give this cake more of a fall vibe, I used the Spice Mix variety and folded a can of apple pie filling into the batter. If you can’t find a box of Spice cake mix, just add 2 teaspoons cinnamon to a box of vanilla mix. You can use homemade apple pie filling but canned works great. I do highly recommend you chop the apples small so they can disperse more throughout the cake. If you don’t know what a poke cake is then you are in for a real treat! This type of cake typically starts out with a simple cake made in a 9×13 inch pan and is often made using a box mix. After the cake is baked and cooled for a few minutes, the cake is then poked all over the top using the end of a wooden spoon or a straw. You’ll think you totally ruined your cake but trust me, you want the holes. After poking the cake you’ll pour a sweet sauce on top like caramel, chocolate sauce, or sweetened condensed milk. The holes allow the sauce to seep into the cake better, making it extremely moist and ultra delicious. The cake is then finished off with whipped cream and a sprinkling of some sort of topping like heath, nuts, chocolate, or sprinkles. What other toppings can I put on the Caramel Apple Poke Cake? I chose to top this cake with peanuts because they are a classic caramel apple topping but if you’re not a fan of nuts or want to be allergy friendly, some other great toppings include: heath, toffee, or mini chocolate chips. 9×13 Inch Metal Baking Pan with Lid– I LOVE LOVE LOVE this baking pan. I use it for making cakes or any sort of bar treat because it allows me to store and transport with easy and it’s air tight. It’s perfect for this Caramel Apple Poke Cake because you have to place the cake in the fridge. 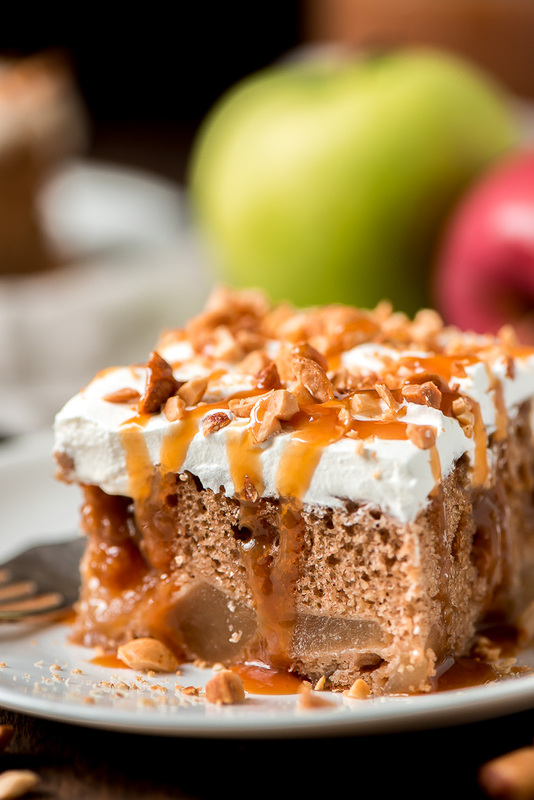 Enjoy apple season with a slice of this easy Caramel Apple Poke Cake! No one would ever guess that this sinfully delicious, moist, caramel loaded cake started from a box mix. Preheat oven to 350 degrees F (325 if using a dark pan). Grease with cooking spray. Mix together the cake mix, water, eggs, and oil together with a hand electric mixer for 2 minutes. Fold in the apple pie filling and then spread evenly into the pan. Bake for 28-30 minutes or until toothpick comes out clean. Let cake cool for 10 minutes and then poke the top of the cake with the end of a wooden spoon or a straw, poking just halfway through (about an inch). Pour 1 cup of the caramel sauce over the top of the cake and cool completely and chill in the fridge. Spread Cool Whip over the top and sprinkle with peanuts. Slice and serve topped with more caramel sauce. Store in fridge. 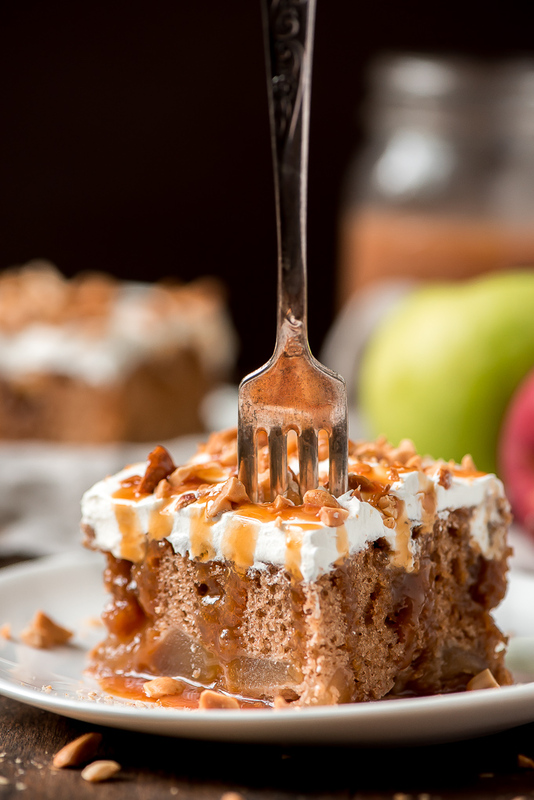 Your Caramel Apple Poke Cake looks amazing! I am a huge fan of poke cakes and I’m pinning this one, it’s glorious! 🙂 Happy fall! They’re such a fun kind of cake. Thanks Kim! Caramel Apple Poke Cake. name itself fascinated me for reading this article. it is like blast of flavors with great taste. it was very easy and still impactful dessert. Keep going you are amazing.